This article was posted on Facebook by Rotarian Evan Burrell. On this day 27th of January 1947, Paul Harris Died. The death of Paul P. Harris, the founder of Rotary International, and its President Emeritus died yesterday in his home, Comely Bank, at 10856 Longwood Dr. He was 79 and had been in failing health in recent years. He was a lawyer in private life. Mr. Harris founded Rotary in 1905, and since then had seen it grow from a single club with a few members in Chicago to 5,638 clubs in 75 countries with more than 259,000 members. A spirit of loneliness influenced Mr. Harris in part to create a worldwide organization. He was born in Racine, Wisconsin but raised in Vermont. He was educated at Princeton and the University of Iowa in 1891. For five years he roamed, working as a newspaperman, an actor, and a salesman. He worked on fruit farms and twice worked his way to Europe on cattle boats. In 1896 Mr. Harris settled in Chicago and began the practice of law. Although friendly by nature, he had few friends, and he saw others, like himself not native to the city, in a similar situation. One day in 1900 Mr. Harris had dinner with a lawyer friend, and later the two strolled the neighborhood where his colleague introduced Mr. Harris to several neighborhood merchants as his friends. Up to then, Mr. Harris had not made social friends out of these business friends, or clients. The neighborhood experience gave him an idea. Mr. Harris decided to organize a club of representative business and professional men in fellowship and friendship. Three of his clients, Silvester Schiele, Gustavus Loehr, and Harry Ruggles, joined with him. They met periodically in the old Mme. Galli restaurant, often called the birthplace of Rotary, where over the dinner table they discussed plans for the club. On Feb. 23, 1905, Rotary was born and was so-called because its members met in rotation at their several places of business. The idea spread, and similar clubs were formed in other cities. The essence of Rotary's purpose was and is--serve; high standards in business, professional and community life. The Rotary Club of Blue Island-Crestwood and other Rotarians created a memorial at Mount Hope Cemetery in Blue Island, Illinois to Paul Harris and his life-long friend Silvester Schiele. The cemetery is best known for the Rotary memorial as well as the resting place of Lions Clubs International founder Melvin Jones. "As Rotarians walk on the path leading to the Paul Harris Shrine, it is almost overwhelming to realize how this humble man spawned an organization that has spread throughout the world. The pictures tell the story, but the true feeling sets in when one visits his grave site and sees the Shrine that was dedicated to him. Harris' friend since before the turn of the century, and the first Rotary president, Silvester Schiele not only lived next door to the Harris', but his grave was moved to the memorial for Paul Harris after the founder's death. Today, in Mount Hope Cemetery near the southern edge of Chicago, there is a "work in progress" known as the Paul Harris Memorial. 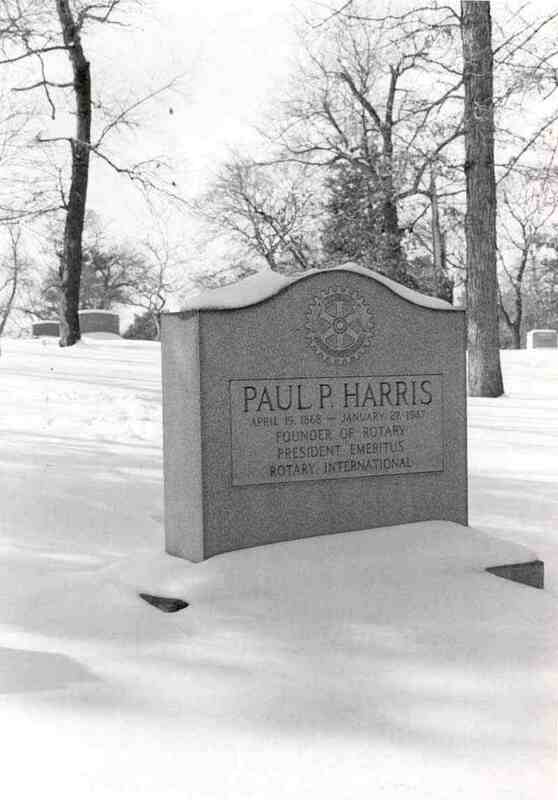 It is a memorial to Paul P. Harris, who founded the Rotary movement. A few feet away from the humble resting-place of Harris is his longtime friend Silvester Schiele, the first president of the first club of Rotary - Rotary One in Chicago, IL.